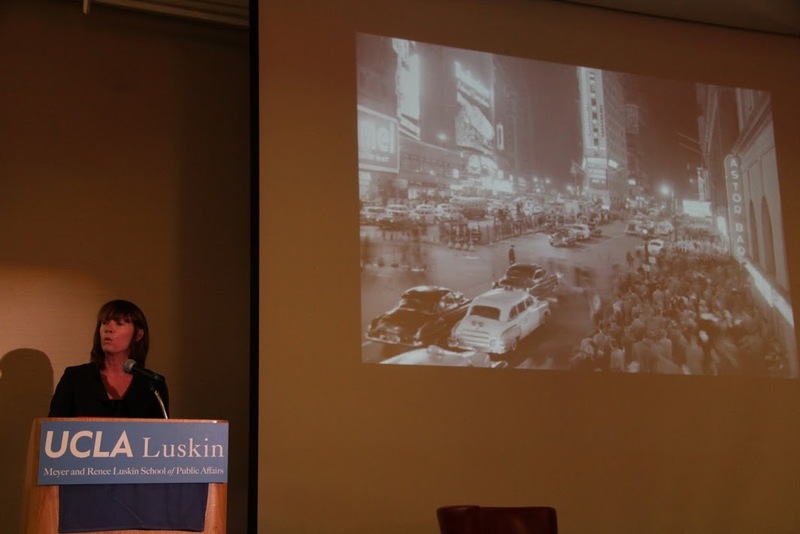 Janette Sadik-Khan at last night’s event talking about closing parts of Times Square to traffic in favor of pedestrian plazas. Photo by Juan Matute/UCLA. I had the good fortune of attending a forum last night with Janette Sadik-Khan, the innovative Transportation Commissioner for New York City. She was the featured speaker at UCLA’s Luskin School of Public Affairs Complete Streets Initiative, an effort to make local streets more user-friendly for pedestrians, cyclists, transit users and motorists. New York has taken a number of bold steps since Sadik-Khan began working for Mayor Michael Bloomberg in 2007: building new public plazas in places that were once streets (including parts of Times Square), creating new bus rapid transit lines with the New York MTA, adding 300 miles of bike lanes and implementing traffic calming measures to reduce fatalities and injuries caused by motor vehicles in New York City’s five boroughs. The New York MTA is also building a new subway line and extending another. In other words, New York City made a lot of significant changes quickly, not letting distractors or controversy get in the way even when things didn’t break their way (such as a plan to implement congestion pricing in Manhattan). I think most of what she discussed is highly relevant here, given that some big changes are underway in L.A. County courtesy of Metro’s Measure R program along with many other local initiatives and projects that are either being discussed, studied or implemented across the county. •”Just remember the headlines don’t always translate into the opinions of actual people,” said Sadik-Khan. Couldn’t agree more. It’s difficult in some media reports to gauge the degree of opposition or support for a particular projects and many media outlets either don’t offer the context or disclosed they rely on the same people for years for quotes. •”Safety and sustainability go hand in hand,” she said. “You won’t get more people walking or biking if they don’t feel safe.” Several cities in L.A. County are quickly putting in new bikes but I haven’t seen a lot of data about which are being used and which are not — and why not. For example, there are new bike lanes directly next to three lanes of freeway-like traffic on Huntington Boulevard in El Sereno. It’s great to have the lanes, but I have seen very few people actually using them and non-productive lanes could harm the overall program. •”People are hungry for public space,” she said, adding that the city managed to avoid its usual five years to complete construction of a project on the public plazas by moving quickly with paint, new curbs street furniture and simple landscaping. Sadik-Khan also said that New Yorkers had given up on the notion that New York’s streets could be changed — because nothing much had been done since a series of one-way streets were created in the 1950s. All in all, a very good reminder to all agencies that speed is a good thing and earns the public’s trust. Taking forever to do relatively simple things (i.e. website upgrades) is a good way to make it look like you’re not minding the store. 1st Street in New York after a makeover. A bus lane at right was added and at left, the parking lane was moved away from the sidewalk as a way to protect a new bike lane from the general traffic lanes. Photo: New York City DOT. A couple of other take-aways on this point: L.A. has the same exact issue as far as its streets go — traffic often stinks, but there seems to be high resistance against doing anything different because of concerns it will impact traffic. Also, New York has seemed especially adept at creating public spaces that are easy to reach. I really like the new Grand Park and L.A. Historic Park in downtown L.A. but I wouldn’t give either a gold medal for their connections to surrounding streets or sidewalks. •Sadik-Khan said that Mayor Bloomberg is very data driven, which isn’t surprising for a billionaire who owns a giant media company. Therefore, changes impacting transportation are closely tracked to determine if they’re working and a lot of public data is created to earn the public’s trust. (Check out these bike usage stats). That’s how the city knows that retail and car safety has greatly increased near public plazas and the corridors where bus and bike lanes have been implemented. (Here are the stats from when the Times Square plaza was made permanent). •How did New York do all these things politically and fiscally, asked Metro Board Member Richard Katz, who attended the event. Sadik-Khan said the plans originally came from PlaNYC, a citywide effort to engage residents on planning and transportation issues. They were ultimately approved by community boards across the city with funding from the city budget, which under Bloomberg has emphasized these projects as economic development opportunities, i.e., mobility + quality of life = a strong economy. My three cents: how often do you hear that discussed here? •Of course there was the inevitable question on what Sadik-Khan would recommend for Los Angeles. She reminded the audience that she attended Occidental College and didn’t have a car at the time, the reason she believes L.A. is doing the smart thing by building out its transit lines (something long in place in New York). She specifically mentioned the importance of connecting LAX to the rail system. She also said it’s important to have bold leadership — not a knock at anyone — and that a good way of showing that is to push projects that be built within the four or eight years a mayor is in office. “Otherwise people believe change can’t happen,” she said. All in all, it was a great talk — inspiring and mildly depressing at the same time. It reminded me of the many big changes underway here, namely the new rail lines that have opened or that are under construction (two currently, three soon). It also reminded me of the many big unfunded or under-funded plans here, i.e. the Los Angeles River master plan, the Los Angeles Streetcar, the many worthy transit and planning projects that are beyond the reach of Measure R.
Checking the numbers on their government website, it turns out that NYC did not add 300 miles of bike lanes. Of that total, 95 miles were for shared lanes (sharrows). Which brings the total just over 200 miles of bike lanes. Los Angeles has added 100 miles of bike lanes in two years. At this pace, another two years will match what NYC did in five years. A big problem with trying to add bike lanes from here on out, in Los Angeles, is that all of the remaining streets on the bike plan requires a lane removal from motorized vehicles. It will be tough going to put them in. At least one councilmember has repeatedly refused to allow any space to be taken away from motor vehicles and even went so far as being against installing traffic signals on a residential street to allow bicycles to safely cross two busy streets. The city of Los Angeles does not do bicycle counts. Its been up to the Los Angeles County Bicycle Coalition to provide counts every two years. There were only 17 intersections in which to compare the last two counts, which is not enough to get a full picture of the total number bicycles being used daily. Of those, only three intersections got new bicycle infrastructure between the first count and the last count. They were the only intersections that got a double digit increase in bicycle use. In fact, these intersections had a double-digit increase above the average of all the 17 intersections. These were along Woodman Ave, 7th St and York Blvd. According to the 2011 Census Bureau American Community Survey Los Angeles has a 1% modal share for bicycling. If Los Angeles achieves what would be an average increase in bicycling for the 90 largest cities in the U.S. for the amount of bicycle infrastructure that was installed last year per 100,000 population, then there should be at least a 10% increase in the bicycle commuting modal share results for 2012. This does not take into account the influence of rising gas prices or CicLAvia on the rate of cycling. The bicycle commuting modal share increased 45% in LA from 2007 to 2008 due mainly to the rise in the price of motor fuel and this rate of cycling stayed approximately at the same modal share thereafter. The motoring public is allowed to weigh in on whether there should be safety improvements on a street for bicycling. Yet, they are not allowed to stop safety improvements for pedestrians or motorized vehicles. Its as if we are in a coliseum in ancient Rome voting thumbs up or thumbs down on who gets maimed or killed and the final decision maker (councilmember) is going with which ever way the vote goes. The safety improvements being used for bicycling consists of two white stripes on busy streets. Compare that to the crumple zones, safety cages, seatbelts, safety glass and airbags required for cars and the grade separated sidewalks, crosswalks and walk signals installed for pedestrians on every arterial street in Los Angeles. Still, motorist object that the inconvenience that bike lanes may cause them should outweigh safety improvements for the bicyclist. There are 1,400 miles of arterial streets in Los Angeles. This is almost exclusively where bike lanes will be installed. There is an average of four lanes per mile and if two parking lanes are calculated as one lane, then there are an average of five lanes per mile of arterial street, or 7,000 miles of lanes. Bicycling deserves the amount of those lanes equal to their modal share, which would be 1%. That would be 70 miles of lanes, yet less than 10 miles of lanes have been taken away from motor vehicles to install bike lanes. Implementing all 719 miles of bike lanes that are on the 2010 bike plan would take away less than 7% of the motor vehicle space on arterial streets. Portland was able to achieve a 6% modal share for bicycling using the same engineering tools that Los Angeles is now using. The majority of bike lanes installed in Los Angeles only provide enough space to ride single file. That is sometimes suddenly reduced with parked car doors swinging out in front of bicyclists, which could cause physical harm. Yet, this bike lane space improves the safety of those exiting or entering parked cars on a busy street. Transit users, private motor vehicles or pedestians are all given enough space to walk or sit side-by-side. Why should bicycle users deserve anything less? If only bicyclists would obey the rules of the road as automobile drivers are. Bicycles should have license plates like cars. Then when a rider cuts me off, dares me to kill him or smashes my right side mirror I could at least have a chance of identification. Currently all I can do is run over him and that is always going to be my fault no matter what he or she did. Sign me – venting on the westside.